I love Sherlock Holmes. I cut my teeth on reading his detective stories. Arthur Conan Doyle is solely responsible for me getting into mysteries. When I saw the book, Elementary, Mrs. Hudson I decided it might be worth it to read it. That was years ago. I finally took down the book and read it, again. Shows the impression the first reading gave me. I didn't realize I had read the book until passages kept looking way too familiar. Oh, well. So I reread it, but I don't think it changed my opinion of it. Mrs. Hudson is called upon by her old friend, Mrs. Violet Warner. Actually, Mrs. Warner calls Mrs. Hudson in hopes Sherlock Holmes will attend to the case. Alas, Mr. Holmes and Dr. Watson are on holiday in Africa for two weeks and can't be reached at the moment. Mrs. Hudson decides to take his place and goes out to the St. Clair place. There, Mrs. Hudson encounters a distraught Violet who claims Lady St. Clair was murdered, but everyone else claims it was natural causes. Violet doesn't buy it for one minute and has Mrs. Hudson looking into things. After sleeping on it and waking up to find another body of an unknown girl, the police and Mrs. Hudson think something's afoot. Sure enough, there's plenty afoot and Mrs. Hudson and Mrs. Warner decide to team together and search it out, which they do, thus solving the cases. I don't know what kind of rubbed me the wrong way about this book nor do I feel like exerting my energy in finding out the answer. I might pick up this series again or not; time will tell. Apparently, the buying public agrees with your assessment, madame - this is the first book, I believe, where the book is unavailable on Amazon (hence the lack of a link at the bottom). Luckily, if anyone wants it, it IS available used, for only a penny! we had a 2-volume "Complete Tales of Sherlock Holmes" on our bookshelves when i was growing up. i can't say how many times i read those cover-to-cover. 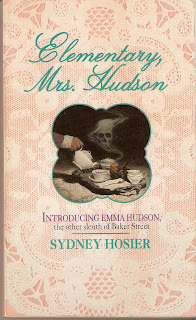 Sydney Hosier should know better than to try to write a knock-off of a Sherlock Holmes story. it's gonna always look poor compared to the originals. I tried to read a Holmes story once, the one where Moriarty kills him, or perhaps it was the one where it's revealed Holmes isn't really dead? I'm not sure, because I couldn't get past the first couple pages. At the time, I was looking for something specific, so that might have influenced my focus going in, or perhaps I shouldn't have started in the middle. Either way, I didn't particular enjoy Sir Arthur Conan Doyle's style. I do expect to try him again someday, but it might be awhile. Holmes knockoffs aren't always a bad thing, though. The movie Without a Clue was hillarious. IIRC, there's a bunch of rather short SH stories. lumped together in a section called "The Casebook of Sherlock Holmes" maybe. that's probably a good place to start. i think the story with Holmes' apparent demise (seemingly thrown over a waterfalls) is fairly long, as is the next one where Watson finds out it was all a ruse. I actually read the review for the other Mrs. Hudson novel. I passed up on trying to find the book, I've got too many to get through as it is. Perhaps Doyle is an acquired taste. His writing style is definitely different, but I just devoured the Sherlock Holmes books, primarily for the puzzles the cases presented. I found Without a Clue hilarious, too. However, I have to admit my favorite Sherlock Holmes will always be Basil Rathbone. Doyle, like Dickens, is harder to read, today, because we don't read in the same way we did 100 years ago. You have to invest a lot in Sherlock Holmes, to really enjoy it, I think, and so you have to really have a reason to try hard, or else be crazy. The phrase 'it's an acquired taste' implies one must take time and effort to acquire it, and with some things (say, alchohol) I just never saw the point. With Victorian authors... I guess I'm in the 'crazy' category. Well, I generally read the books from that time period, and love them, and yet still I didn't really hook onto it. But it was back when I was trying ot find that 'finger in my pocket' reference and reading all those Dashiell Hammett stories. I'd skimmed through about 100 stories from different mystery authors with no luck, and my brain was kind of dead. I think that has a lot to do with my distaste at the time. I don't think it's just the time period. Charles Dickens, and to alesser but still significant degree, ARthur Conan Doyle, are kind of like the Cinnamon Role joke. You have to want to have roll on dryly for a long time, and be prepared for being very underwhelmed at times. It's not a purely Victorian issue, or anything. I don't know, if I think hard about it, it's sometimes difficult to say why it's worth bothering. i agree with Christina - the main joy in reading SH stories is solving the crime alongside Watson and Holmes. as literature, it's probably poor. IIRC, ACD thought it was quite lightweight, and wanted people instead to read his metaphysical writings. alas, the public found those to be rubbish. what makes SH stories so unique is that they're still fun to try to solve, even on the 2nd or 3rd reading, when you already know whodunit.